Set in 1930s London, which is the time period of the original novels by P. L. Travers, the story follows Michael (Ben Whishaw) and Jane Banks (Emily Mortimer), who are now grown up. Michael is living with his three children and housekeeper Ellen, in the house on Cherry Tree Lane. 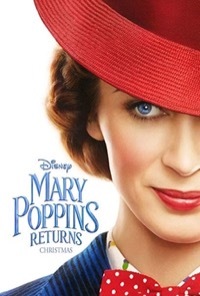 After Michael has a personal loss, Mary Poppins (Emily Blunt) comes back into the lives of the Banks family. She is joined by a street lamplighter named Jack (Lin-Manuel Miranda), and an eccentric cousin named Topsy (Meryl Streep).